Cross Stitch Party [C5998] - $10.00 : Yarn Tree, Your wholesale source for cross stitch supplies. Cross stitch pattern Amy Bruecken Designs. We like to party, cross stitch style! 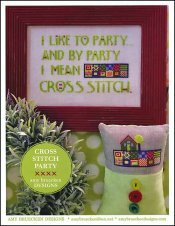 "I like to party...and by party I mean cross stitch," is stitched in the middle of the design. A rectangular box featuring small squares with a cross stitch design in each square, is stitched next to the saying. Also included is a design for the pillow which features the rectangular box of the mini cross stitch designs, with a house & tree stitched on top. It's time to throw a cross stitch party with all of your stitching friends! Stitch counts: Frame is 102 x 65 & Pillow is 50 x 34.